Finally, I got my Final Year Project's (FYP) title already. The title was actually my last choice out of the 6 titles I chosen... anyway, I'm still glad that I'm able to work on the title that I choose, although I'm not very excellent on Chemistry-based subjects. The title that I got is about antioxidant properties of edible fruits/herbs/gingers. Antioxidant... interesting huh ??? Been to library yesterday after class to search for some information, text books and thesis written by the seniors on the title. I flipped through those thick thesis related to my title and got a shock of my life: most of their supervisor were Dr. Lim Yang Mooi !!! I remembered her talking about cancer prevention during a sharing session in the 4th GBHEF (check back here for some details on whats happening during the event) with Yen Yee as the emcee for that session. Most of the thesis that I read through seems to be quite difficult to understand, especially the method used to conduct the experiment and collecting data/results. After throwing away those thesis, I looked for relevant text books/reference books for similar information. The first thing I noticed was... damn, where the heck are the books that I needed !? Every book that I looked through doesnt seems to be useful enough for me. But in the end I managed to found a frequently-borrowed book with notes scribbled down and corners of the pages folded... which is quite useful in the sense of getting a rough idea where to start my project. I walked myself to Block C Cafeteria for the usual CO practice. And I realized that how much I miss the bright sunset over the mountains and above the lake. The wind was cold but soft, and it ease my mind from the stress. Finally reached the cafeteria and we all gathered outside for practices. Without surprise, we're informed that the concert was delayed. We ensembles + practices a song and called it a day. Great... it'll be a boring day then. Found this interesting video few days back. Its a cat sandwiched between a some say strawberry-flavored Pop-tart with rainbow coming out at the back. The song is quite funny and cute. If you ever tried to sing with the cat, I'm so sorry to say that its difficult because you're not fast enough to sing it !!! If you're wondering what does "nyan" means, it is actually taken from the Japanese word にゃあ (pronounced as "nya"), which is the sound that cats make. More info on this cute-looking Nyan Cat, please refer to Wikipedia. One more thing... if you ever wanted to sing along with the cat WITH lyrics, it is better to sing without it since the whole song only consists of NYAN and I couldnt find a correct lyrics because I'm not fast enough to sing through all the Nyans posted on those lyrics website !!! Its been a busy week, although its just Week 2 of the semester !!! 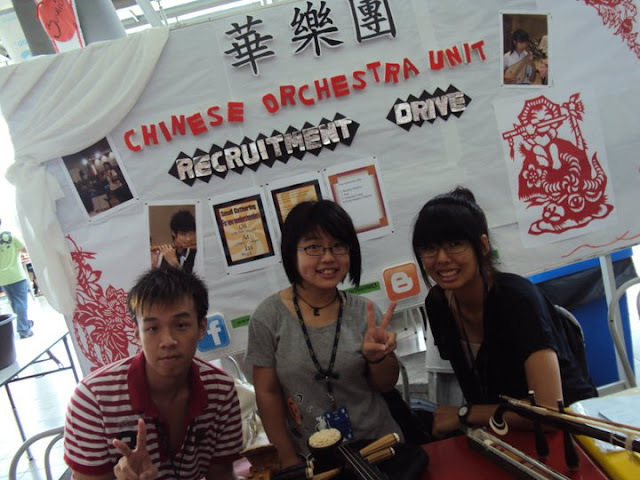 I'm assigned to most of the days to be a helper in the Chinese Orchestra Unit booth being set up in Block C Cafeteria for the last 5 days. 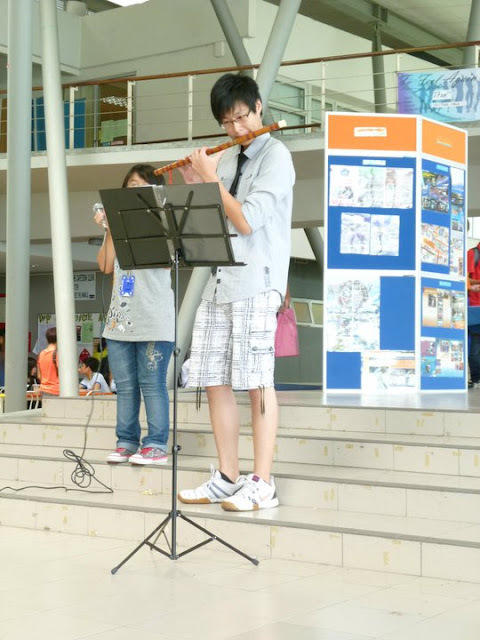 I was asked to go on stage perform to attract the attention of the crowd in cafeteria and for promotion of our Chinese Orchestra Unit among the students. Managed to play "To Zanarkand" from Final Fantasy X on DiZi with slight mistakes unnoticeable. Here's some pictures taken during the recruitment drive. Nothing much to add on for the week, but the thing for sure is: I dont want my FYP !!! Can I just skip my FYP and graduate !?!? One last thing, here's a preview of our Chinese Orchestra's second concert poster (the poster is still under construction, I just took one of the best design to have some small promo). 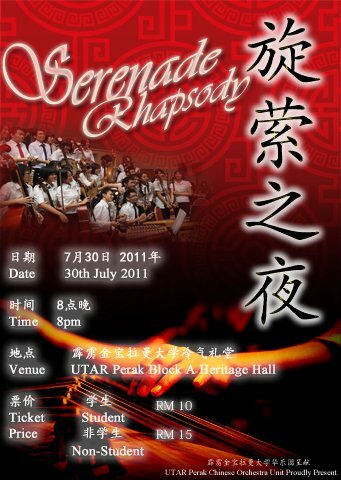 For more information on the concert, you all can always refer to our UTAR Kampar campus Chinese Orchestra BLOG for more information regarding the details. Tired now... gotta go and have some nap now. 被 點 到 必 填 ， 不 填 代 表 你 不 尊 重 傳 給 你 的 人 和 問 卷 .